As it turns out, I have a pretty serious love/hate relationship with the word casserole. “Casserole” … a piece of cookware. No problem with that..
“Casserole”… a way to serve 10 people an “easy” dinner (aka chunk of slop next to a side salad). Wince. Puke. “Casserole”… a clever way to conceal the fact that 6 sticks of butter is what makes that squash so delicious. I have a huge problem with that. “Casserole”… the piece of cookware that works well to hold lots of healthy, yummy ingredients together…Getting better. Note: This recipe says nothing about being a casserole. You see, even though some of you might call this dish a “casserole,” I refuse. 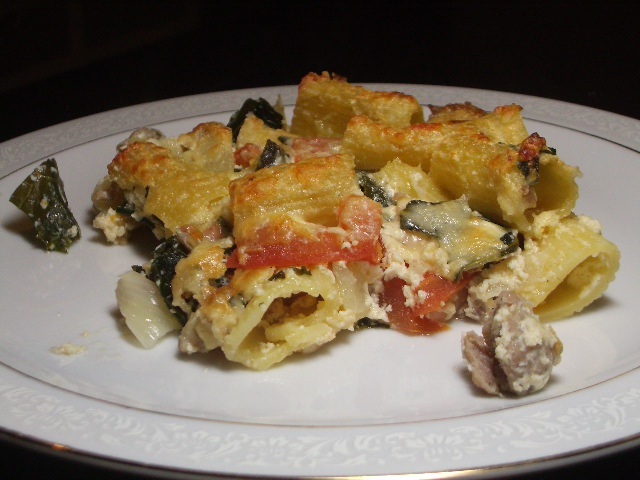 Yes, it was baked in a casserole dish…it’s some pasta, some sausage, some cheese, some healthy greens, and some fresh tomato…all baked to perfection together. It is not slop. It is not hiding 6 sticks of butter…in fact, it’s quite healthy. So, in my life, it is NOT a casserole.